Today, I'm going to show you the mini album that I swapped with some friends. I really love the way these little books turned out and the girls all loved them as well. This was made with the CD Envelope Jackets. I did a class on these back in December and will be doing one in February as well. To the left is the front of the book. I really love the flower detail on this. 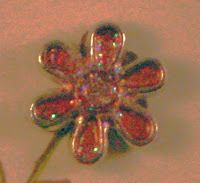 I used the D esigner Flower Brads and colored them with Crystal Effects mixed with a reinker and then sprinkled them with Dazzling Diamonds glitter. A little messy but the result was worth it. See for yourself, here's a close up. pages. There's also a page that pulls out from the pocket on the left hand side, so three scrapable pages! Next is the last two pages but these are unique because they also feature a pop up piece with three small envelopes. Inside the envelopes you can put other small pictures or save it for journaling! Here's the book fully open so you can see what it looks like all fanned out! I can't wait to fill mine with some special pictures. 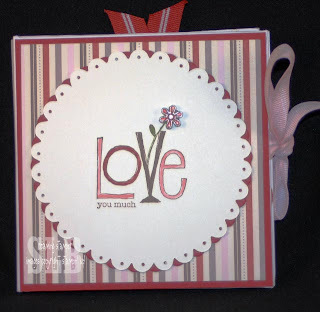 This book was made with the Love You Much Stamp set, Candy Lane Designer Series Paper and the new three Heart punch! I'm off to the convention center...more later! Girl, you are SOOOO creative! I love to read your blog ideas! I love this book Sharon. Thanks so much for showing the details. That flower is amazing. As Paula said, thanks for showing the inside - it's is really a beautiful book. Congratulations!! I saw your class on this on the SU demo site. Very nicely done!!! I know you have no idea who I am, but I check your blog EVERY single day! So thanks for all your inspiration. I left you an award on my blog! I love this! I want to purchase the CD envelops. I haven't been able to find them locally at Office Depot, so I guess I'll need to order them from Uline. It's a little confusing which ones to order. Do you happen to remember the item # on that?